Bitcoin is having some respite and showing some power to move up .Analyst opinions were mixed when Bitcoin was trading in the $6700 to $6800 range last week with many noting $6850 as the point where momentum will turn positive. However previously when Bitcoin is reaching 6850$ it seems like bitcoin move up because of bull run trap made by institutional investors. But if we look at Bitcoin it still looks weak in terms of volume and price so bitcoin can move down to 6000$ levels and 5800$ levels too so be prepared but don't panic a lot it is for shorter term not for long term. But surely in future Bitcoin is going to surpass 25000$by the end of this year and 65000$ by the end of next year and more 1,00,000$ by 2020 so please look for 2020. Some Experts believe that Bitcoin will surpass market capitalization of 2,50,000$ means will take over Berkshire Hathway which is currently running by World Billionaire Warren Buffet. On the hourly chart, price action is currently trading near the 50EMA which is likely to be acting as resistance. $6750 to $6850 will act as strong resistance with price failing to break this level last week. But in the near term, 50, 100, & 200 EMA on the hourly time frame should be seen as the key resistance levels. 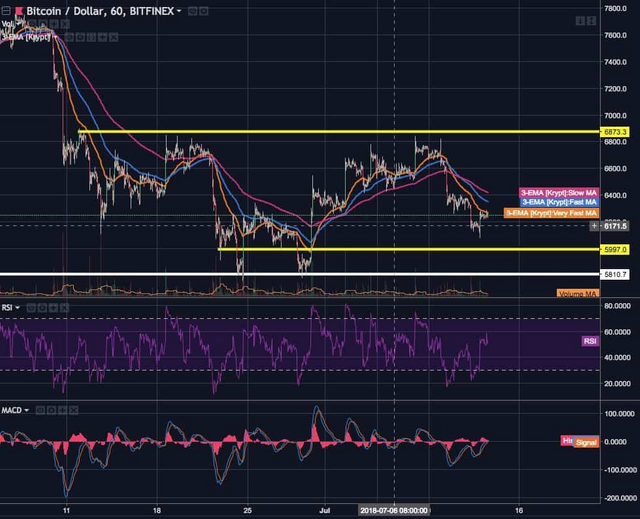 Analysts are viewing $6850 as a potential turning point as this would break the pattern of lower lows and lower highs on some of the larger time frames which can act as a catalyst for a change in trader sentiment. Key resistance levels to note include the $6000 level and the $5750 to $5800 level. Buying pressure at the $6000 level may not be as strong as the last time it approached this level as traders will be aware that price action has recently traded in sub-$6000 levels. So the key support level to watch out for is $5750 to $5800 which represents the all-time low of 2018.